It is not an exaggeration to say that Urban Marigold's flowers were one of the best parts of our wedding. As someone who wasn't even going to have flowers (too expensive, impermanent, etc. ), I cannot believe I ever considered that option. Jen's expertise, warmth, responsiveness, and kindness not only made the aesthetics next level but also made the experience enjoyable. From the bouquets to the boutonnieres to the chuppah to the centerpieces, Jen brought brought the entire space and day to life in a beautiful way. Guests commented on the flowers all night and their brilliance is even remarked upon in our pictures. Having Jen/Urban Marigold was one of the absolute best decisions we made. I can say without a doubt that working with Jen was the easiest part of our wedding experience. Her amazing creative eye, communication, flexibility and very evident love for and knowledge of her craft not only make her a joy to work with professionally, but her enthusiasm, humor and kindness truly set her apart as a person. She went above and beyond to make sure every detail was just right, and no idea of ours was too big or small to be executed. (Crazy idea - can we do an intricate hanging garland three weeks out? You bet!) She listened to our vision, patiently worked and reworked ideas until they were perfect, and just made the experience as seamless and enjoyable as it could be. If you want the flowers of your dreams and also someone you'll truly enjoy meeting and collaborating with in the process, you're in wonderful hands with Jen. It was nothing but an absolute pleasure working with Urban Marigold! Jen went above and beyond to make sure that our wedding celebration at Big Daddy’s Antiques was the best it could be. Jen was organized, on it, and thoughtful. The floral arrangements Jen created were absolutely stunning and exactly what we had in mind. These combined with Jen’s perfect execution of our various decor elements brought our entire vision to life. Jen played a huge part in the best night of our lives, and we can't thank or recommend her enough!! Urban Marigold/Jen DeMarti is incredible! She did such a great job with my wedding flowers. From my flower crown to my bouquet and centerpieces, everyone loved it. I received many compliments. Jen is a professional and is so dedicated to her craft. She listens to her clients and provides great suggestions to execute her clients' vision. My San Diego wedding was a gem with the beautiful job by Urban Marigold. 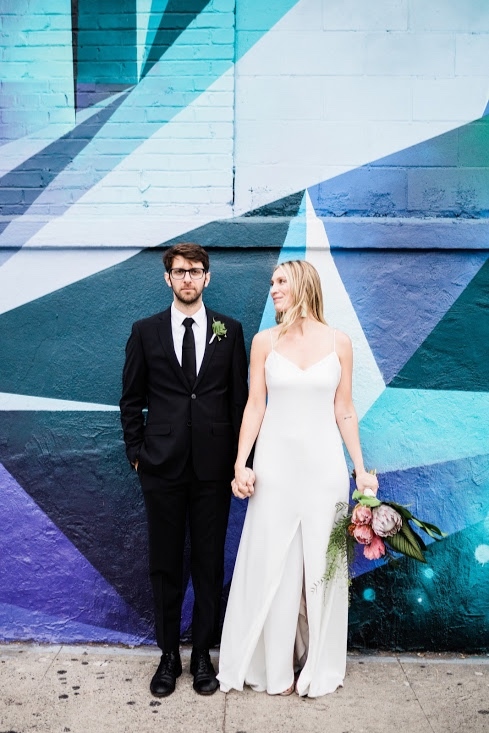 My husband and I loved working with Urban Marigold. Jen is patient, creative and turned out to be one of our favorite wedding vendors.